I have a major soft spot for modern houses. 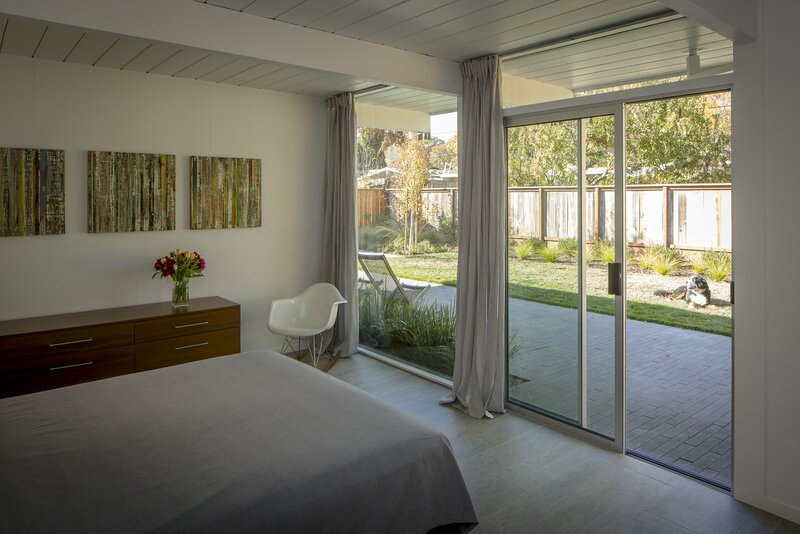 Eichlers have always been a favorite of mine with their central atriums and floor-to-ceiling windows, which often span entire walls. These design elements were intended to blur the line between the indoors and out, making residents feel as though they were living within their natural environment and not completely separated from it. 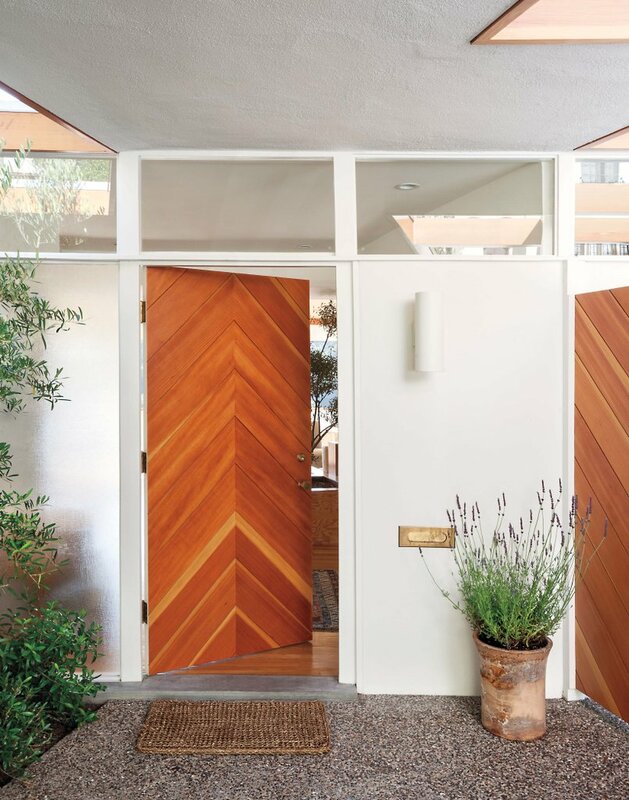 In addition to forging a closer connection with nature, these homes made it easier for people to embrace indoor-outdoor living. I'd love to be able to do that year round, but the weather in New England isn't exactly conducive to that lifestyle. I also think any floor-to-ceiling windows I'd have in any house of mine here would need to be quadruple glazed! Is that even possible? 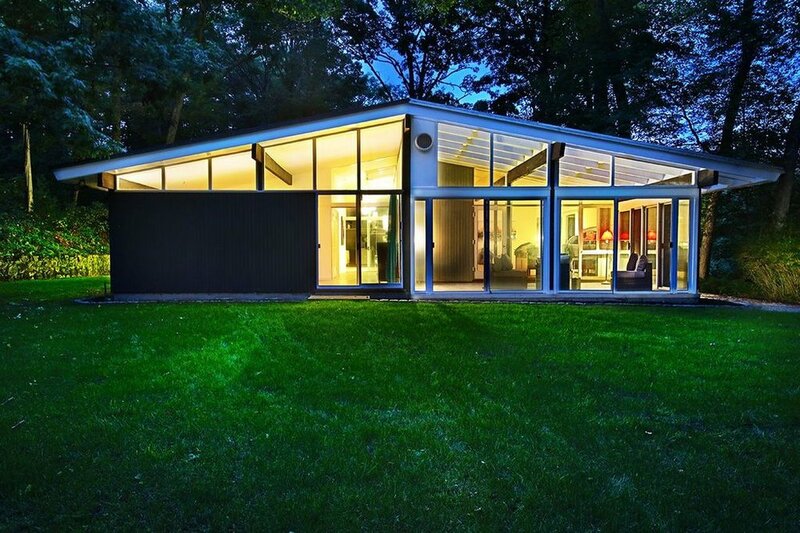 Anyway, I get so excited when I see modern Eichler-esque houses for sale around here. 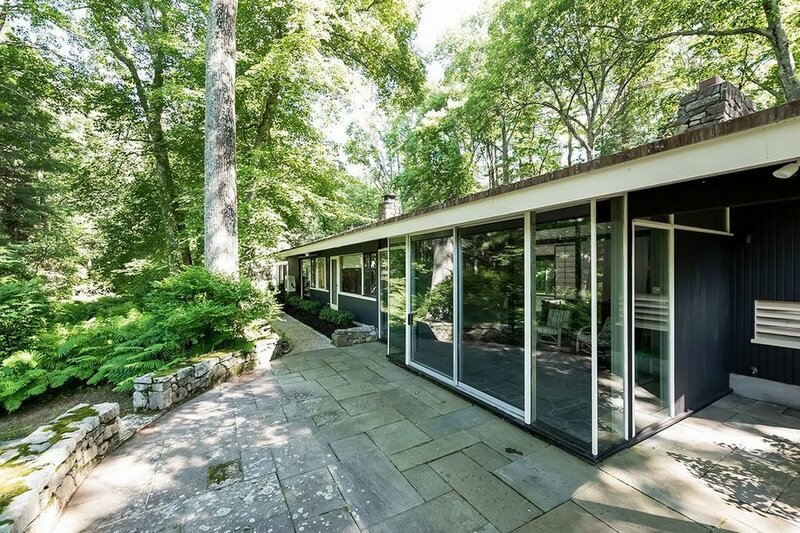 There tend to be a lot of modern houses in and around Lincoln, MA, and many of them are enormous and fancy beyond anything that would ever resemble a modest, no-frills Eichler. That's one reason why I was drawn to this listing in Dover—at 2,800 square feet, it's relatively modest in size, yet it boasts a spacious open floor plan with a truly picturesque view of the Charles River. 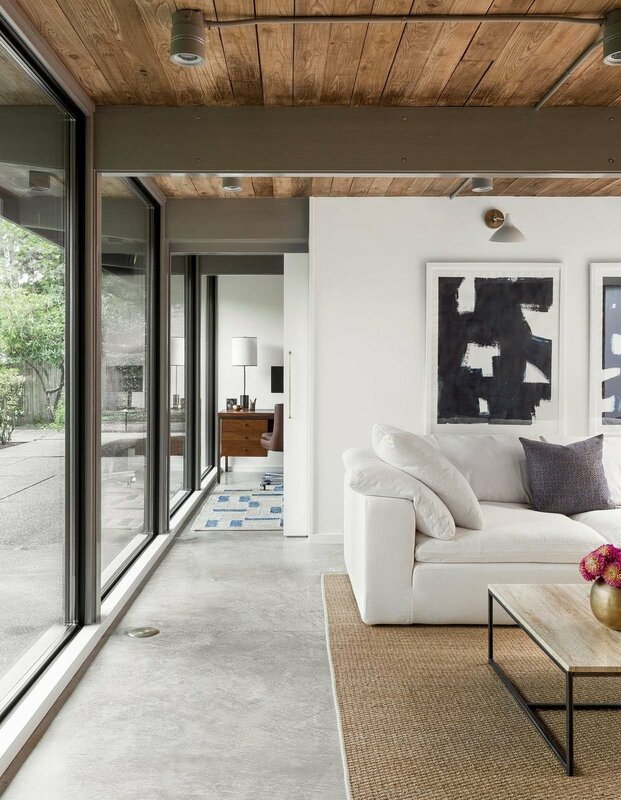 The clerestory windows let in tons of natural light, and the materials used throughout the interior include stone, wood, and concrete. These elements are echoed outdoors on the house's wooded lot with pebble walkways, a bluestone patio, and stone walls. Did I mention it's nestled on a very private 6 acres of land? The driveway winds through the trees and delivers you to this view. I am in love with the little bridge that leads to the front yard. Out of view is the river to the left and a three-car garage to the right. This view is why I love modern houses with floor-to-ceiling windows. The glow from the interior lights at nighttime is so welcoming. Think about how festive the outdoor space would look with an expanded patio, fire pit, and some string lights. A different view of the house and its wooded lot. It vaguely reminds me of the property around Fallingwater. This patio sits beneath the trees and would make a great spot for relaxing with a book, enjoying a cocktail, and admiring the scenic property. Inside, there's abundant natural light. Vertical beams stand in place of solid walls to create a modern, open-concept layout that's typical of houses built in this style. A large fireplace with a stone facade punctuates the center of the living room. 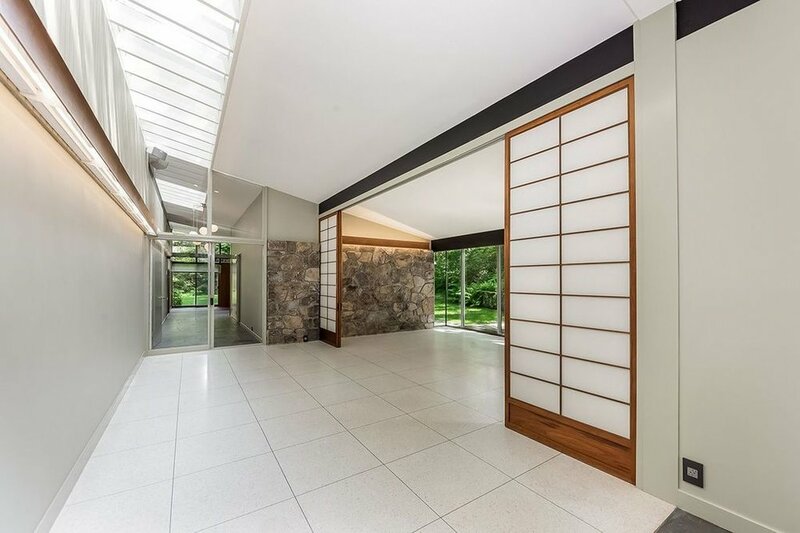 The high ceilings and wall of glass make the space feel large and airy. The sliding door opens onto the shaded patio previously pictured. A set of Shoji doors separates these two areas. I'm not sure what their intended use is—a hallway and second living area? It's also hard to tell from the photo what material was used on the floor, and while it could be terrazzo, the seams make me think it's a type of vinyl. Look at this bedroom! Wouldn't this be an amazing place to wake up every day? I tend to require a completely dark room for sleeping, so I would need to come up with some light-blocking solutions for this room, but the views outside are so calming and restful. Below, a different bedroom has ample windows and wonderful views of the yard. Again, it's hard to tell from the photo, but this floor might be polished concrete. Don't you want to move in right now? I know I do! I'd also love to decorate a house like this. The windows and ceilings and beams are perfect, but I think I'd soften the stone details and warm up the flooring as much as possible. 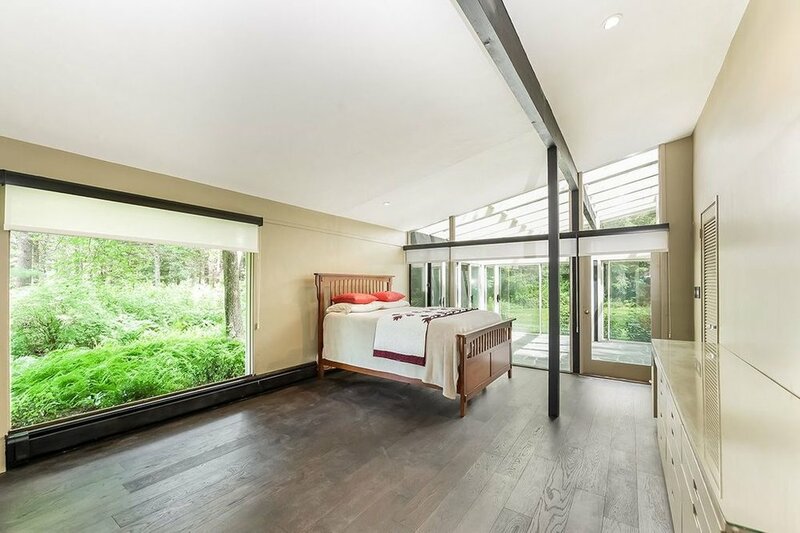 I collected a few photos of similarly modern homes that embrace their natural surroundings, sloped interior ceilings, and large floor-to-ceiling and clerestory windows. Bright white walls, rich wood tones, and a mix of antique and new furnishings all seem just right for decorating a modern house in the woods. How would you decorate this home if you had the chance? 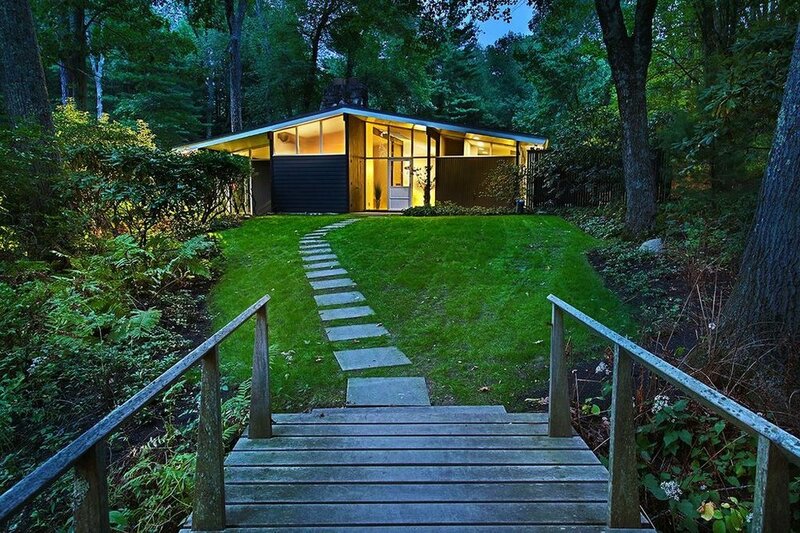 To learn more about this unique modern house in Dover, MA, visit the listing page. All photos of the house are from the listing. Click through the inspiration photos for sources.